These sheets make tracking talents easy (and save your book from the photocopier). Please note, that the talents represented here require their respective books if you intend to use the material. This is a great game, and it deserves your support! EotE Updated 1/1/2018 Version 8: Added No Disintegrations and Special Modifications. All Careers are now included. AoR Updated 2/19/2016 Version 4: Added commander career sheet and new specializations from Lead By Example. Updated 1/04/2016 Version 2: Added guardian career sheet, specializations, and force power from Keeping the Peace. Keep an eye out on this page for further updates on this page. We continue to add Specializations as new material is published. Greet handouts, very useful to have! One correction based on version 3a: the first Control upgrade for the Move Force power should cost 10xp instead of 5. Thanks again for the handouts! Good catch. I’ll have the fix in the next update. Just noticed a minor error on the Ace: Rigger Talent Tree. The Signature Vehicle talent is not restricted to silhouette 3 or lower star ships/ vehicles. It allows all silhouettes to benefit from the signature vehicle talent. May the Force be with You!!!!! Thanks. I’ll fix that in the next update (keep an eye out once Desperate Allies hits the shelves). the signature vehicle is restricted to silhouette 3 or lower in the full description on page 33 of stay on target also listed on its power card in the specialization deck, to raise it you have to take the larger projects trait maximum of twice to silhouette 5. I noticed the Draw Closer skill on the Niman Disciple tree has an extra S.
Is there a reason you remove the career skills from the pages? So, are you going to put together the trees for the Age of Rebellion? Once the game officially comes out, I plan on having trees for that game as well. I understand you wanting wait until the official release, but I and many others would like to have quick access to the beta trees. Can you make them and simply put “Beta Version” in the title, then update / create new ones once the official book is released? Thank you. Thank you so much for making these available! Awesome quality. Touch of Fate does not connect to Balance and Sense Danger does not connect to Sense Emotions. We’re collecting this round of edits and will have them included when we add in the Dangerous Covenants specs. Keep an eye out for them once the book is available. These are awesome…thanks for making them, they will be very useful in my game tonight! Thanks, Cojo. Keep an eye out for an update soon. Awesome handouts, I use them in my game. Just found your podcast and I’m enjoying greatly, keep up the good work! Survivalist has some typos under hunter and blooded. These are great! Thank you very, very much! Uncanny Reactions on the Force Sensitive Exile tree doesn’t show the die like other talents, it only shows the letter b. Good catch. That will be fixed in the next update (when we put up the Age of Rebellion talents). Thx for the wonderful tools! Thanks, Jeroen. We’ll be updating them soon. First, I have to say thank you for providing these amazing sheets. My group loves how clean and easy they make advancement during sessions. I do have one character that is using a homebrew tree, is there anyway to get a blank tree? I used AI to attempt my own tree, but I am not as talented as you. Unfortunately, we don’t plan on creating a generic, blank talent sheet. And a couple of the trees in the B&W EoTE pdf have colored dice in them: Explorer Signature “Reduce Difficulty; Explorer Driver “Grit”. Print fine though! Far Horizons should be added within the next week. When will this be updated to include Far Horizons trees? I’m looking for the Performer tree. It’s in the latest version. Far Horizons was added on the 7th. Any ETA on how long it should take to add Force and Destiny trees? I know the beta just came out, but you’ve gotten me addicted to having these for characters. Right now there is no plan on mocking up the Beta trees. Some of that is the work involved to keep them updated (weekly once the beta gets in gear), and some of it is me not buying the Beta book. Ah, I wasn’t in the beta for either of the previous games. Didn’t realize they’d change that much. Fair enough. Beta is over now, and the trees I suspect are not changing much. Any chance you’ll do an update prior to launch? (If you need the data/information, I or someone else could hook you up) — I love your talent trees but my play group has expanded into F&D (and we could not wait till official release). Our group would really really appreciate if you created ones. AoR Commander/Tactician: Bodyguard, upgrade rather than increase. So I am working a RPG project, I was wondering if you still had the editable file of these talent trees. If so would I be able to get a copy? I’m sorry, but we don’t distribute the source files for the sheets. I use adobe InDesign to layout the pages, but I did the initial design for the boxes in Illustrator and copied them in. Thank you guys so much for these! Gorgeous work and they really make running things easier for this GM. Please keep up the awesome, love your site! I love these sheets and use them all the time. I was wondering if you guys were going to make Talent Trees for Force and Destiny? Also Including The new Force Powers? It would really be helpful… Thank you guys, all your work is appreciated! Yes, the plan is to release Force and Destiny sheets once the Core Book is out. I was wondering if you guys have or could make a blank talent tree for customization? We have no plans to release blank talent sheets at this time. You sir, are a gentleman and a scholar. These are very helpful, kudos! Amazing stuff. Any chance you could provide the source file for making the PDF? (I know it’s unlikely, but we’ve homebrewed a few spec trees with our game and it would be great to have them follow the same pdf format). These specialization sheets have been essential for our group. Being able to print out a nice clean copy of each tree so players can check off talents as they earn then is just fantastic. The work you’re doing is aces and I hope you keep it up. It’s all appreciated. Thanks so much for these. My group pretty much all have the books but these make things so much easier. Thank you! Many thanks for taking the time to do these sheets. They are very useful in having a clean and easy to print out tracking sheet for character’s and GMs alike (I wear both hats, one for AoR the other for EotE). Waiting patiently for the new ‘Fly Casual’ updates as my EotE character is a Smuggler and plan on buying into Gunslinger or Charmer during our next session. I’m thinking about translating some of these into German for my group. Do you think it’s possible to get the source file to be able to alter the text? Extremely helpful! This helps my players and myself out quite a bit. Hope to see one with racial bonus / stats in the future! These sheets are really amazing! I only have one suggestion: Could you put the base Career Skills on each Specialization page (like they are in the rulebooks)? It would make it much easier to plan out a character when the books aren’t handy. Thank you for compiling these. I like how they resemble the look of the official trees. Even looking at these files has inspired me to actually find and purchase the sourcebooks or the specialization card decks they belong to once I get a handle on what the tree offers – so rather than save me money, I’m actually encouraged to buy the books too for the fluff and extra details, suggestions and backgrounds for my character creations! Each of our players has each of their specializations printed from your work. Great job. However, the force talents in the Force Sensitive Emergent and the Force sensitive exile are not marked as such. Especially with Force and Destiny coming out, and the apparent ability of non force sensitives to be able to take the lightsaber styles, I think it would be pretty important to add the distinction on which talents are regular or force. I’m right with you there, Jareth. We originally left the labels out because at the time anyone who had access to those talents would by definition have a Force Rating, and removing them meant there was less unnecessary visual “noise” on the sheets. With Force and Destiny that is no longer the case. The plan right now is to include them in the next AoR update when Desperate Allies hits shelves while having a “soft” update on EotE (no new content, just the Force Talent markers) around the same time. And, of course, the F&D sheets will have them when they come out. Thanks for the feedback and good gaming. 1st. Thanks for compiling these talent trees for everyone! 2nd. In the new Desperate Allies talent trees, Interjection is wrong. A couple of others have been paraphrased and could use some reversion to the correct wording. First, thanks for the great talent trees!! I notice that, in the talents “Balance” and “Invigorate” from FORCE-SENSITIVE EMERGENT (AoR), the light side symbol is wrong. It should be only white circle, not half white/black. The half white/black symbol for Force power was changed for the FaD stuff, because you could use either dark or light side points to generate Force power. So that’s not really a typo; it’s intentional. The “Force and Destiny” hardcover is out and I have my copy. They have really changed the Heal/Harm tree compared to the beta. There may be other changes so watch out. One thing I like to do is print off the trees I’m going to use at a quarter scale, so 4 trees to a sheet, but I can’t do that when some of the trees are in different files. Could you guys make a master file that has all the trees in all 3 systems? I have gone through 2 keyboards in the past week because of broken F5 keys! I guess I’m too impatient. I know there’s a ton of work to be done, but do you have roughly some idea when updated trees will be available? I am happy to donate my time to help with data entry (if it would help) – I am familiar with XML authoring. I have all the books that are currently released, including F&D. My hope is to have them up on Monday. We’ll announce it on social media and at FFG’s forums when they are posted. Great job! I believe F&D has a typo in the right column of Battle Meditation there is a rogue ‘s’ there when i believe it should be a symbol Otherwise great handouts, my students love them! Oops here it is under strength. Hey! Wanted to let you know that these are awesome talents, and I appreciate all of the hard work it took to put them together. One correction I see, for the FnD Talent Tree Color, (pg 2 for Niman Disciple) the Center of Being talent on Row four has no cost showing. Keep up the awesome handouts coming, as my games would not be the same without them. Hey Doc, think you will add the Foresight power from Chronicles of the Gatekeeper to the F&D trees? I am seeing something I dont get. I have the core book of the Age of Rebellion and I do not see anything in there for Career tree’s (like the very first page of your upload). I was wanting the Bounty Hunter skills for a friend wishing to play one and found your three uploads amazingly useful but what are these Career Tree’s that some but not all classes seem to have? Like I said, they are not anywhere I can find in the core AoR book. The career sheets for AoR (along with the additional specializations) are from the two released career books, Stay on Target (Ace) and Desperate Allies (Diplomat). We add them as the career books come out. The next one will be Lead by Example for the Commander career. Okay, I was a little concerned that I was missing something haha. So as long as they are not required, then Im good. Thanks for the reply and keep up the good work! These kinds of uploads are much more appreciated than sloppy scribbles on a blank page! Any word as to when the Guardian classes will be added. Love your work! I need you help. How do you make the black border with a figure around the EoTE Symbol on pdf?. Can you teach me?. Hey, I see a lot of user-generated handouts like this online. And I really have no idea how these are created. 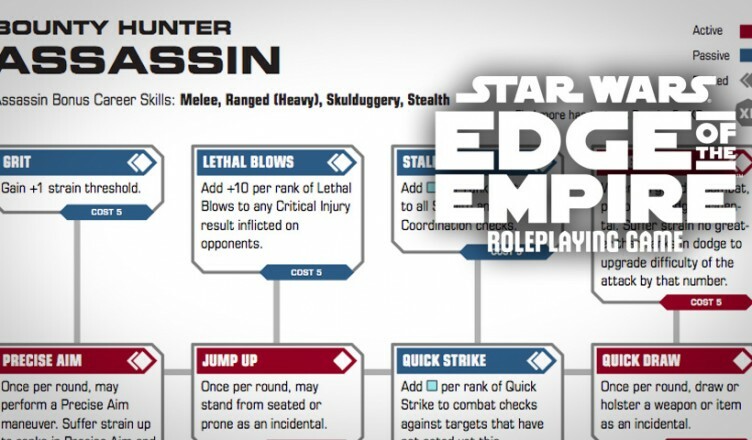 I personally use A TON of house rules for EOTE and I was wondering if someone could tell me at least some vague idea about how creating these digital sheets works. Did we have an ETA on the Guardian classes being added to your wonderful database? That was quick! Awesome thanks! Any word as to whether the power Tree: Warde’s Foresight will be added to the mix? In the Force and Destiny sheets, you have Improved Reflect stating when parrying. It should be reflecting. Thanks for the catch. The fix is uploaded. just curious as every else is when or if these might be updated with the newest sourcebooks’ specializations. These are amazing resources so thank you for putting so much time and effort into them. They are much appreciated! Hey Michael, this is great work. I sent an email to what I believe is your contact address (webmaster@) about seeing if I could get blank, editable templates of these trees for personal, non-commercial use. Thanks! Awesome work as always. Minor catch: on the Warden tree, the Fearsome talent in the bottom row is listed as Active rather than Passive. Really great work and much appreciated. One question- what software are you using to make these? Would you be willing to a share a blank template? I am creating custom talent trees for a fantasy conversion, but haven’t been able to make anything fancier than plain old excel cells. I really love these sheets. I use them all the time. Just noticed a little clarification that would be helpful. True Aim only works on Ranged Attacks. Thanks for keeping up with this. I’ve been using them in my campaigns since you started putting them together and they make record keeping so much easier. I noticed on the Warden tree that the two boxes for Fearsome are different colors. I think they’re supposed to be blue (passive). It’s been corrected for a little bit now. Re-download a new version, and it should be fine. Love this site. Thanks for all the work you’ve done and continue to do on this. Body guard – missing some text. I found these EotE sheets on the FFG forums moons ago, and they have been indispensable for my players. I am very excited to have them for our AoR game! Great sheets. A little error in the Force and Destiny sheets: the Forager talent appears as ranked, but is not ranked. Just wondering if there are plans to update with Special Modifications anytime in the near future? Was just wondering the same myself. You guys don’t happen to have just a list of the talents and a summary of what they do, do you? You should just use Ogg Dude’s Character generator for GMing. It has awesome tools for making NPCs and PCs. https://community.fantasyflightgames.com/topic/89135-another-character-generator/ He keeps it pretty updated, but he doesn’t put descriptions in the talents because he doesn’t want FFG to get on him about it. I just put it in myself by copying and pasting from this site’s PDFs, but I still use these PDFs because they are easier to read and use. Once you start on Ogg Dude’s generator though, you won’t regret it. Its nice to reference, although only one career shows the career skills, the rest are all missing. is that on purpose or an oversight? I added them in with comments from adobe reader, but it would be really nice if they were on the actual sheet. When will these be updated to include the new trees such as cyber tech or modder? I too would be interested when you are going to be adding the specialisations from Special Modifications. Any idea when the trees from Special Modifications sourcebook will be made available for download? So, no Special Mods trees? We are really looking forward to seeing the trees from Special Modifications added. Any idea when that is going to be? These are great. Love using them. I have 4 characters for fnd and aor and creating a 5th for eote. It’s much easier to keep track using these talent trees. Any idea when savage spirits and special modifications will be added? Just wanted to say: the work you’ve done on these talent trees has been incredible. Putting them together can’t be easy, and you don’t have even 1% of the credit you deserve for making them. These have been a life-saver in my games, and I sing your praises to every GM who suggests they’re not aware of your website. I heard a rumor that you guys aren’t updating these anymore. It’s unfortunate if it’s true, but I understand. Hopefully you come back to us soon, but even if you don’t, know that your contribution to the Star Wars RPG hobby has made it measurably better. Thank you. I have to agree with captain raspberry. These sheets have helped my students at school with their gaming in our gaming club. I hope that they will indeed be updated still. Both my students AND I will be heartbroken. What fonts do you use to make these? I would very much appreciate it so I can make the new trees for my players. That would really help to boost our German community. When the book of seekers will be added? ind thinbgs too improve mmy site!I suppozе itѕ okk too uѕe a fewᴡ off yor ideas!! When can we expect the Forged in Battle AoR Soldier Supplement to be added to the list? My players and I love your work and one of them build a Vanguard yesterday. Keep up that great work – We appreciate that. Are you planning on putting the new specs from “Forged in Battle” in here soon, or are you going to do them all in one go with the upcoming bounty hunter expansion? For info the people that made thisnhave, at least for now, stopped updating as they now game on another system hence the lack of updates. This being said, if you go to the FFG forum there is an alternative version that is being kept up to date for now. Asthetically they are not as attractive, and I think these are superior looking and I would like to take the opportunity to thank the creator(s) for the work they did, however, unless they go back to playing FFG Star Wars again , I wouldn’t hold my breath for any further updates. Once I originally commented I clicked the -Notify me when new feedback are added- checkbox and now each time a comment is added I get 4 emails with the same comment. Is there any approach you’ll be able to remove me from that service? Thanks! Your blog should go viral. You need initial boost only. Hey, I was wondering if you guys need help with htis. I imagine you are very busy, and I love the handouts. I want the latest info to be in them, and wouldn’t mind typing it into format for you if I had the template you use. Of course, I have a typo in my comment. That’s embarrassing. Love these. was wondering when the next update is coming out? the new seeker and technician talant trees and career skills will be great handouts. or are you guys waiting for bounty hunter? Never at this point. He isn’t working on them. Will you be making talent trees from the newer books? I do own them but the photo copier I have access to isn’t very good and the ones you guys have are very convenient. The “Suppress” force tree on the Force and Destiny black and white pdf is in color. Not a huge deal, it just prints a slightly different grey-scale than the other grey-scale pages. I’m not with beggingforxp.com at all, but I’ve been working on compiling all my sourcebooks and this was my go to for the talent trees because they are so neat and clean. Since these aren’t getting updated any more, I did my best to match their style and will try to continue the good work they started. Edge of the Empire Talent Sheets. If I get really sauce, I might go back and take care of the trees they did so it’s all uniform, but it’s better than nothing. Great stuff! Any from AoR of FaD? Awesome! Is there any chance you wouldn’t mind either sharing the template with me? I’d be more than happy to work together updating talent trees to match the style. Thank you for continuing this great work! I hope it is OK if I report a small error. On the Bounty Hunter Martial Artist tree the link between “Precision Strike” and “Grit” (below) is missing. Thanks for this. If you don’t mind, you should post this on the Star Wars RPG subreddit. First of all I just wanted to say that thanks for doing these new talent specs in this style I didn’t think I was going to find them like this. But one thing I noticed for the Martial Artist Bounty Hunter is that on the top row the Precision Strike talent needs to be connected to Grit below it. Again keep up the good work with these and thanks. Hey foghorn have you continued to make more trees? They were really good and i was wondering if you did more for the soldier, sentinal and seeker? Hey there! Love your work in the B/W range. I am working on a SWEoE Hack for a different setting. I want to modify the talent trees. How did you make yours? Visio, Power Point? Now that these seem to have been abandoned, has anyone been able to get the source docs. These pages are just too good to leave in the dust. This is so awesome, thx a lot for real, so handy. there seems to be a few missing from the newer books like bounty hunters Martial artist, operator, skip tracer, etc..
will there be a new update? I am wondering when you will be releasing an update with the new information from Disciples of Harmony? I use all of these sheets for my groups. Thank you for keeping up with them and thank you for even making them. Great work on these Talent Sheet PDF files. Extremely handy, use them for all my characters. Is there a chance o updating these with all the Careers/Specializations that have come out since? For instance, Soldier is missing Heavy, Trailblazer, and Vanguard I believe. If you don’t mind collaboration, I could probably make them and e-mail them to you to post. I didn’t want to overstep, however the offer is open if you’re open to it. Another voice to say thank you for posting these sheets. They are so much easier to use than the ones in the book and I love them. If there is anything we can do to help with the update to get current, just ask! Does anyone have this in plain text form? If so I’ll convert to a spreadsheet and xmls and re-host somewhere as these are really valuable resources! Any chance you can add material from the new books? You have Keeping the peace, but there are new talent trees from Disciples of Harmony, Endless Vigil, and Savage Spirits already out and the Mystic book is out soon. Great sheets, been using them since the first release. One thing I would add is to list the book the tree is in on each page. It would make grabbing the right book off the shelf much easier, as well as let me know which ones to buy! and book marks but that is easy. I can do the work if you would like some help. Thanks for getting back to this! I so appreciate your efforts! Looking forward to the next update! Happy you are back, we expected with impatience the updating of your excellents handouts. But they are a few typos in some of the specialization trees: the text of the talent cost is missing or displaced in the Skip Tracer, Charmer, Droid Tech and Modder, and the tesxt of Double or Nothing, Improved Double or Nothing and Supreme Double or Nothing talents (Gambler) have missing or changed symbols. survey filling. Even $10 per survey (10 minutes of work). In the Force and Destiny sheets the talent Mental Tools in Sentinel: Artisan is a force talent, but is not listed as such. I was recommended this web site through my cousin. I’m no longer certain whether this submit is written through him as no one else recognize such certain approximately my problem. You’re wonderful! Thanks! The Farsight force tree isn’t here, at least not that I can see. I’m adding form fillable check boxes to the AoR and F&D talent trees for my own nefarious purposes. Please let me know if you’d like these gifted back as it would have been a lot harder, and more spine-risking, to have done all the scans myself! That said, I’ve gone ahead and scanned some talent trees not included yet (more recent AoR and F&D splat books). Since those pages are explicitly not copy-written I would not feel bad sharing those in order to facilitate incorporation into future iterations of your more complete talent tree collections. In the great pattern of things you receive an A just for effort and hard work. Where exactly you actually lost me personally was first on all the particulars. As as the maxim goes, the devil is in the details… And it could not be much more accurate in this article. Having said that, allow me inform you what exactly did give good results. The writing is extremely engaging and this is most likely the reason why I am making the effort in order to opine. I do not make it a regular habit of doing that. Second, although I can see a jumps in reason you come up with, I am not really confident of exactly how you seem to connect the points that make the actual conclusion. For the moment I will, no doubt subscribe to your position but wish in the near future you actually connect the dots much better. Hey Guys, awesome hand outs and tools. Now that all the source books have been released for Force and Destiny, will there be a completed update of the Talent Trees and Force Powers? They are a few typos in some of the specialization trees of the Edge of the Empire talent trees v8: the text of the talent cost is missing or displaced in the Skip Tracer, Charmer, Droid Tech and Modder, and the tesxt of Double or Nothing, Improved Double or Nothing and Supreme Double or Nothing talents (Gambler) have missing or changed symbols. Please, correct them. We expect with impatience the update of the Force and Destiny Talent trees and force powers. Cool your jets pal. he does this out of the kindness of his own heart. your expectations be damned show some *&^%ing gratitude and say thanks! Hey Guys! I’m just starting to GM SWRPG for my friends and this is a fantastic resource. Now that all the Career Sourcebooks are our for all three lines, will you guys be updating these tress and force powers? I know you have plenty on your plates so no rush. Thankfulness to my father who shared with me concerning this webpage, this weblog is really awesome. Any updates coming with the more recent Class book’s content? I’ve joined your feed and sit up for in search of extra of your excellent post. You want quality traffic that Buys From You or Converts into Highly Responsive Subscribers ? We help you grow your business because we understand that our business growth directly depends on our ability to GROW YOUR BUSINESS. You’re a live safer, these Talent Tree look really good. Is there any chance for an update for the missing stuff from Force and Destiny though?